Good news! No matter which guide you select, you will receive a well-rounded tour of the Battle of Antietam. Every guide has researched and walked the fields around Sharpsburg for years. In addition to a sound overview of the battle, I like to emphasize the human interest stories. Who were the men that were fighting? What type of weapons did they use? What did they witness? I also like specialty tours. If you had an ancestor who fought with a particular unit, I can highlight that unit during the tour. I am open to various forms of transportation on tours: cars, buses, bicycle, segways, horses, carriages, and walking. My interest in the Civil War began as a child. My father would take me to battlefields such as Antietam, Gettysburg, and Shiloh. I always considered Antietam my home battlefield because I live close-by in Hagerstown. You can’t see the rolling hills and uneven terrain in a book. The best way to learn about the Battle of Antietam is to get out on the field. If you are having a bad day, just think about the brave soldiers who fought at battles such as Antietam. I have never experienced a day as bad as those soldiers did. 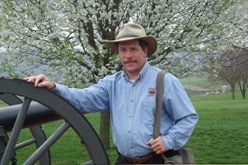 Member of the Hagerstown Civil war Round Table for over 30 years, serving as president for three years. I am a retired Chief Ranger of Antietam NB, and Road Captain for the Harley Owners Group of Chambersburg, PA. We would like to schedule a Motorcycle Ride Tour on Saturday September 28, 2013. I don’t know how many as of yet. It seems that the group is tired of this Old Ranger’s Talk and would like a different look and talk. We plan on a 2 1/2 hour tour. Thanks for your past service to Antietam. To schedule a tour with Justin you’ll have to first contact the Antietam Bookstore at (301) 432-4329, or by email at wmia@hughes.net in order to see if Justin is available. I will, however, also pass along your message to him.